We have a fresh system, let’s install Docker. Here we are using CentOS 7.5 and logged in as root. We can now open our web browser to http://localhost:9999. This will then redirect us to the :8888 port on the server. This way we can access our machine. It will ask us for a token. Now we can put the token that was outputted when we started the docker container. 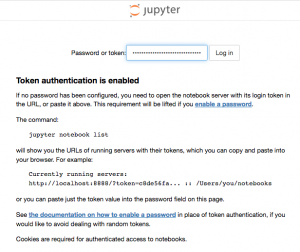 After entering the token we can go through the Jupyter Notebook Tensorflow tutorials. Using Docker is a ton easier than installing everything on this server by hand. We did omit some of the nvidia driver setup requirements found in my previous post.